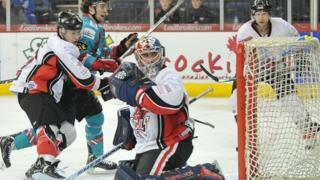 The title-chasing Belfast Giants fall behind four times at home to Cardiff - but win 5-4 in the Elite League. The Devils scored through Chris Blight, debutant Luke Ferrara, Stuart MacRae and Jesse Gimblett. The Giants goals were netted by Jeff Mason, Andrew Fournier, Daryl Lloyd, Kevin Saurette and Robby Sandrock.